Before we delve into the nuts and bolts of speed sensing steering, it is important to know the base of how it functions: power steering. At its core, power steering is simply assisted steering. Having a vehicle with no power steering at all can be the cause of major issues when trying to maneuver at slow speeds or even when you are attempting to squeeze into a tight parking space. A lack of power steering would not be missed at highway speeds as you feel very connected and in control. Nonetheless, you would be hard pressed to find a modern car on the road today that was not equipped with power steering. Now, almost every situation while driving (at least when it comes to steering) is made better by the existence of modern power steering, but not all. When it comes to cruising down the highway at higher speeds, power steering can be somewhat bothersome, and to some, maybe even a little unnerving. At these higher speeds, normal power steering can provide too much assistance which will then leave the driver with a feeling of being disconnected from the road and cause overcompensation in some situations. What is Speed Sense Steering? Is there a compromise between the power steering and speed sense steering? There is now. You no longer have to give up precision control at high speeds and you do not have to implement a workout regimen into your daily driving routine just to be able to park your car. Now you can have the best of both worlds with a system called speed sensing steering. Speed sense steering system does exactly what its name implies. It senses your car’s speed and adjusts the amount of compensation or assistance that it provides to give you the feeling of being in control while steering 100% of the time. At low speeds, the system will provide the most assistance. As your vehicle’s speed increases the amount of assistance that is provided will decrease. Still, by having less assistance at higher speeds, your steering wheel will feel somewhat heavier giving you a sense of being connected to the road. This way you have the best of both worlds! The speed sensing steering enables power steering to continue to function at high speeds but allows for you to have more control when driving at highway speeds. Speed sensing steering is applied in two different ways: hydraulic and electric. With a hydraulic system, a pump spun by the engine’s crankshaft provides the necessary assistance. Since the amount of steering assistance that needs to be applied will vary depending on the situation, electronic controls adjust the pressure by adding and releasing pressure. In an electronic system, a control module is responsible for varying the amount of electricity that is being supplied to the electric motor and thereby is adjusting the amount of assistance that is being supplied to the driver at the steering wheel. These electronic systems have become increasingly popular over the past few years, as there are less moving parts and they are thought to be less prone to failure. Typically, both systems are reliable, but there is always a chance of mechanical malfunction, as there is with any motorized system. 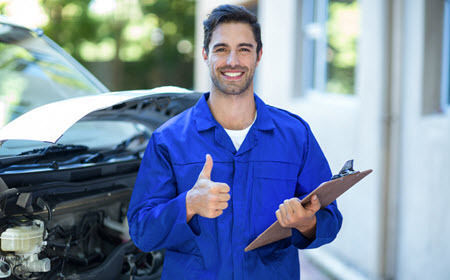 Usually, a light on the dash, similar to a check engine light, will indicate that there is a problem with the system and you will need to take it into a reliable service center to have it diagnosed. Most systems that malfunction will automatically apply the maximum amount of assistance no matter what speed you are traveling. So if your vehicle’s steering feels extremely light at highway speeds, you may have a problem with the speed sensing steering. Even if this does occur, there is no need to worry due to the fact that the system will never cause a complete steering failure resulting in complete loss of control. Power steering is something that many consumers overlook and rarely think about when driving their vehicle, although it is a vital part of their daily commute. Those that have experienced issues with power steering in the past, will be glad to have speed sensing steering in their wheelhouse. If you have questions about your speed sense steering, vehicles that have speed sensing steering, or problems with your speed sensing steering, it is best to consult a professional. If you are local to Dallas, Highland Park, University Park, Irving, or Coppell, Texas, the professionals at Louden Motor Car Services Inc. can help with any and all questions or concerns regarding speed sensing steering.